Turbary Woods Owl And Bird Sanctuary: Profesional Associations and Organisations that Turbary Woods is a member of. We have received Raptor Rescue Approved Status at the sanctuary; we are now on their official list of rehabbers for sick and injured owls and birds of prey. 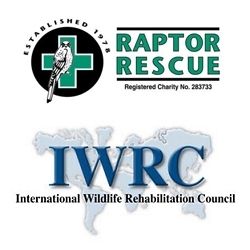 Turbary woods has proudly become a registered member of the International Wildlife Rehabilitation Council.